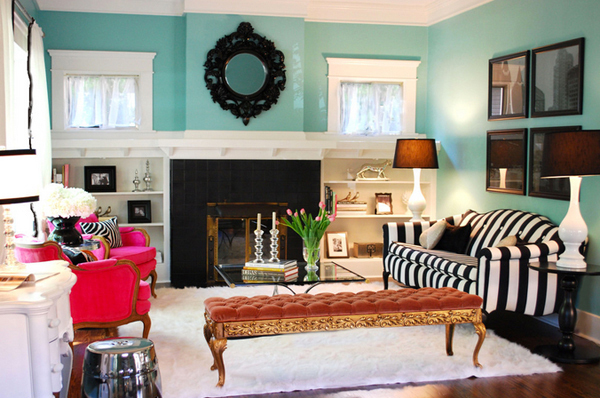 The black and white striped sofa holds its own against turquoise walls, hot pink chairs, and zebra pillows! We can look at this living room all day! The details on the doors are pretty awesome, they accent this space perfectly with their cool color. It is the first thing that you will notice when you look at this picture, but it does not shout attention, something we have to always remember with accent walls. 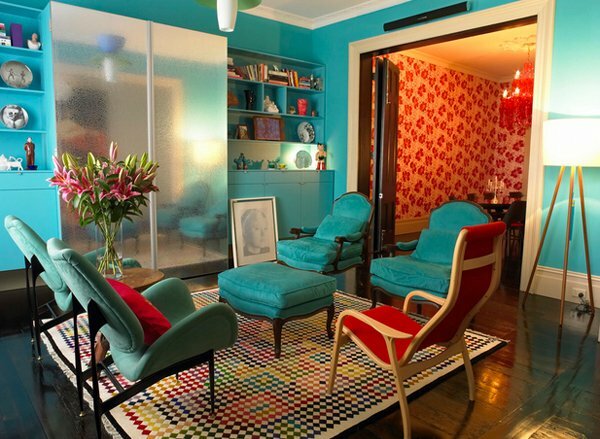 Won’t you agree that the colors in this San Francisco living room are pretty interesting? They sort of contrast each other but complement one another at the same time. The furniture and the decor is unique from one another and each piece seems to tell a lot of story in them. We have three colors that play major roles in this living room; turquoise, moss green and brown. We can see them in the curtains, the pillows, the area carpet and the decors. White basically neutralizes all these colors to be able to mix perfectly. 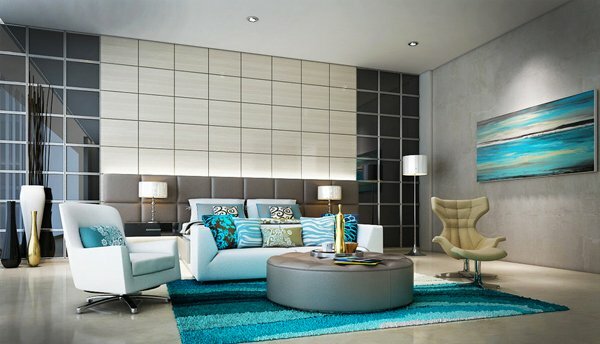 This modern contemporary living room is one stunning sample for a turquoise space. 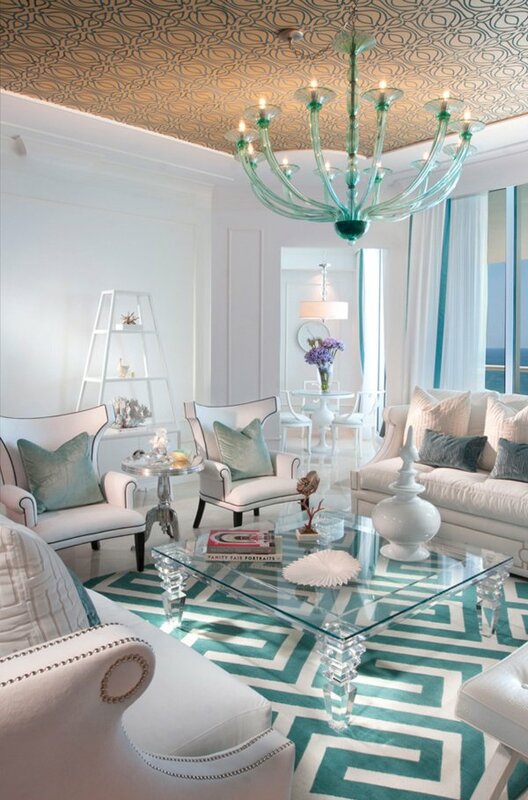 Unique chandelier matching the square glass coffee table. The whites in this space make it chic and real pretty. The Lennoxx has a great array of stunning spaces that incorporates a little bit of everything – just like this white living room with turquoise in it. The painting and the pillows look definitely looks super fine! The paint that goes from the walls to the bookshelves is one great move for the designers, we see regular colored shelved which complement the walls, not rarely like this. The furniture just sits there looking pretty. 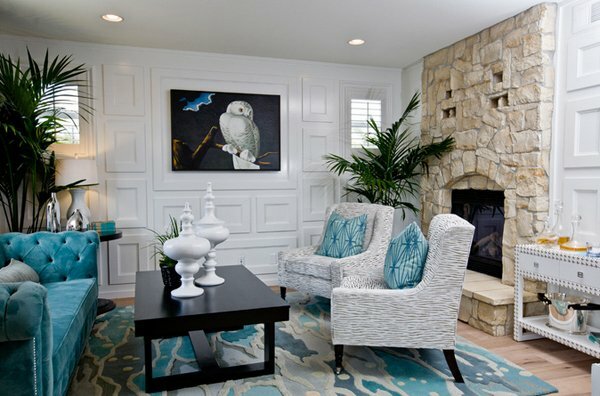 The turquoise accents in this living room are enough to look the part of a stunning space! White makes everything look clean and new, but the turquoise pillows and drapes made all the difference. Borghese grand oval coffee table, Lily white Baroque mirror and an area rug especially made for the homeowner made this Minneapolis contemporary living room extra special. Great color combination too! Nirmada transformed this space into a colorful and eclectic living room to reflect the lifestyle of a client who entertains often. Nirmada had worked with this client over the years, collecting vintage pieces, repurposing old, and adding new to create this curated look. The color of this living room not only looks yummy but because of the decors, it feels really tropical and reminds you of the beach. Wouldn’t mind waking up to this space every day. Great set of seating and accents! The sofa, some of the pillows and the carpet are few of the things that call us to actually want to live in this house. But all honesty, this living room is really neat! The damask wallpaper for this living room is a bit bold but it completes the look of this space. It complements the walls and the furniture and it jives with the cushions and the pillows. One look at this space and we are certain that you are in love with it already. From the walls to the area carpet – super in love with it! This is quite an eclectic living room. 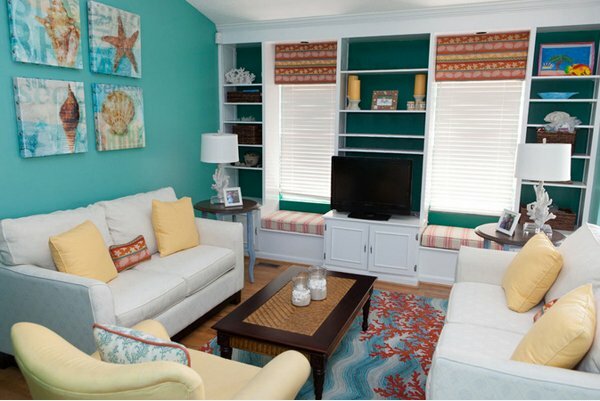 The colors are great and the combination of furniture is refreshing too! Note the red chandelier on the background. 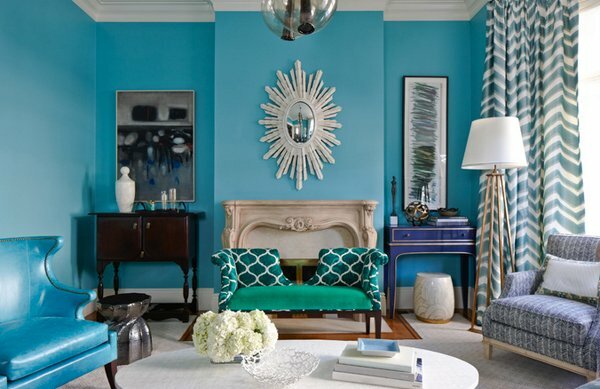 These 15 Scrumptious Turquoise Living Room Ideas are somewhat a reminder of how fun and memorable one particular color can make us feel and want us to recreate that warm feeling we have towards it. If you are into more turquoise fun, check out turquoise interior bathroom design ideas which one of my colleagues has created. Make more memories guys! Entertaining…and I really appreciate this color(blue) it’s refreshing! Vila Redferno has the perfect combination of colors and the furniture too. I like the living room of Tolcha,it loooks stunning! magnificent samples and it inspires me a lot…thanks! Turquoise damask Wallpaper is almost perfect but the wallpaper’s position is like hanging. they’re all attractive design for a comforitable living room. I thought the image of DKOR Interiors is a library w/ a sofa bed..but it’s very eye-catching! I really love this site,you always amaze me of your great designs like this list.